Flutist and poet Wayla J. Chambo presents a program of works for flute alone and flute with electronics that explore the intersections and interactions of text and music. The program features three new pieces written for Chambo by emerging composers Lanier Sammons, Sarah Summar, and L. Scott Price, all based on Chambo's poetry: the composers were offered a selection of poems, and invited to choose one and use it in some way to construct a piece. The compositional approaches are diverse, and the poems may be used structurally or imagistically; they may be fragmented or intertwined; they may be evident in the final work, or they may become an invisible part of the fabric. This is the first installment of the Transcript Project, an ongoing commissioning effort that will eventually grow into a concert-length collection of these poem-based works. In this program, these new compositions are paired with existing contemporary pieces that also use or reference text, including works by Cindy Cox, Edie Hill, and Toru Takemitsu. Finally, selections from Charles Koechlin's “Les Chants de Nectaire,” a massive cycle for solo flute inspired by the writings of Anatole France and Virgil, are interspersed throughout the program, providing a connecting thread. Wayla J. Chambo is a versatile, committed performer of new and experimental flute music alongside the traditional repertoire. 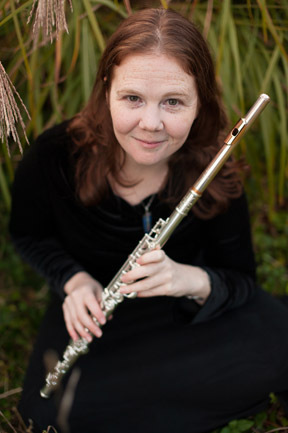 She has premiered pieces for flute and electronics at the CEAIT and Pixilerations festivals, and has recently performed with the Dallas Festival of Modern Music's Ars Nova Ensemble, the Allen Philharmonic Orchestra, the Dallas Wind Symphony, Nova Ensemble, and the UNT Wind Symphony. Chambo holds degrees from the University of North Carolina at Chapel Hill and California Institute of the Arts, and is currently a DMA candidate (ABD) at the University of North Texas, where she was the recipient of a Master's/Doctoral Fellowship award and served as a Teaching Fellow. Formerly on the faculty of Eastern Mennonite University, she is now a faculty member at Thomas Nelson Community College in Hampton, VA.
Also trained as a dancer, Chambo has been recognized for her inter-media performances involving dance and music, including a fully staged production of Karlheinz Stockhausen's “Kathinkas Gesang als Luzifers Requiem,” and a piece combining Bach's music with original choreography which she performed at the 2011 National Flute Association Convention. In addition to her performing work, Chambo also has a background in creative writing and has published poems in The Greensboro Review, Artizen, and Cellar Door.